This is an easy to make risotto. You can use any greens available at each season, such as wild nettles, dandelions, spinach, goosefoot, purslane, amaranth… The long list of spices is explained by my personal choice of not using vegetable stock. Instead I prefer to use my own herbs and spices to give it a more “refined” taste that does not overrule the more subtle aromas and flavours. If you do not have most of the herbs mentioned here, feel free to use vegetable stock or other spices that you have at home like in a regular risotto. Cook the rice with the bay leaves, celery and curry leaves, as instructed in the package (each rice may require a different cooking time). When the rice is half cooked, add the chestnuts and leave them cooking on the top of the rice, just getting extra steamed. 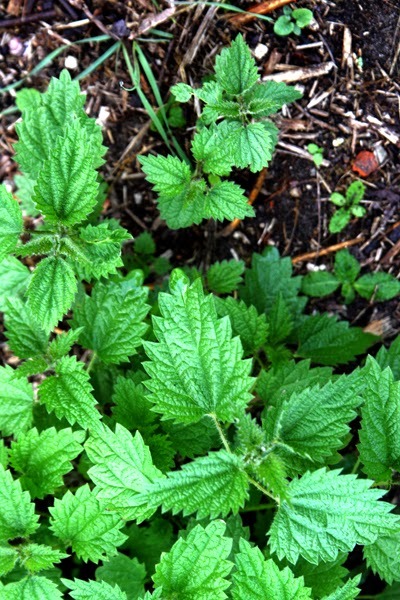 Rinse thoroughly the nettles and blanch them by throwing boiling water over them and leaving it 3-5 minutes. Drain them and press well to remove the excess of water. The liquid you can drink as nettle infusion. Cut the nettles roughly. Zest the lemon and set aside. Cut the lemon in half, juice it, and set aside as well. Heat the olive oil in a large, heavy pot and set over high heat. Cut the mushrooms add them to the olive oil. Turn over to medium heat, and cook until they begin to soften, about 5 minutes. 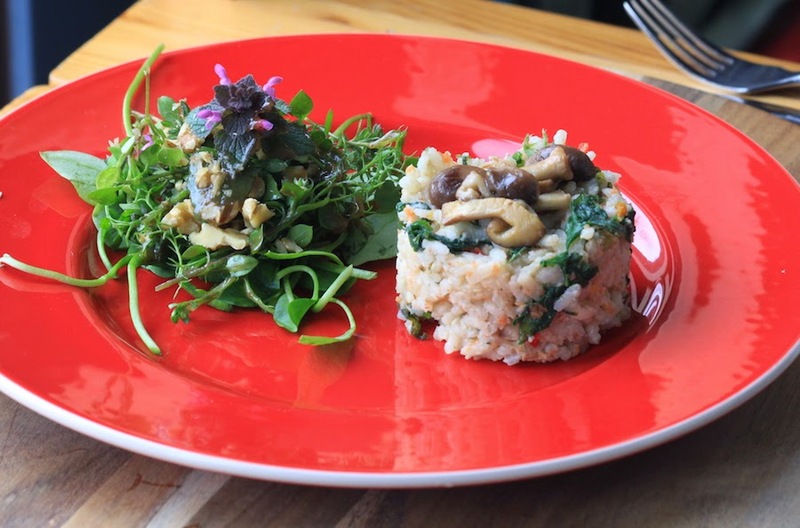 When the rice is well cooked add the carrots, ginger, lemon juice and zest, sea salt, sambal or pepper oil, herbes de provence, mushrooms, nettles, oat cream and nutritional yeast and stir well to combine all ingredients. Adjust the taste with salt or extra pepper to your taste. 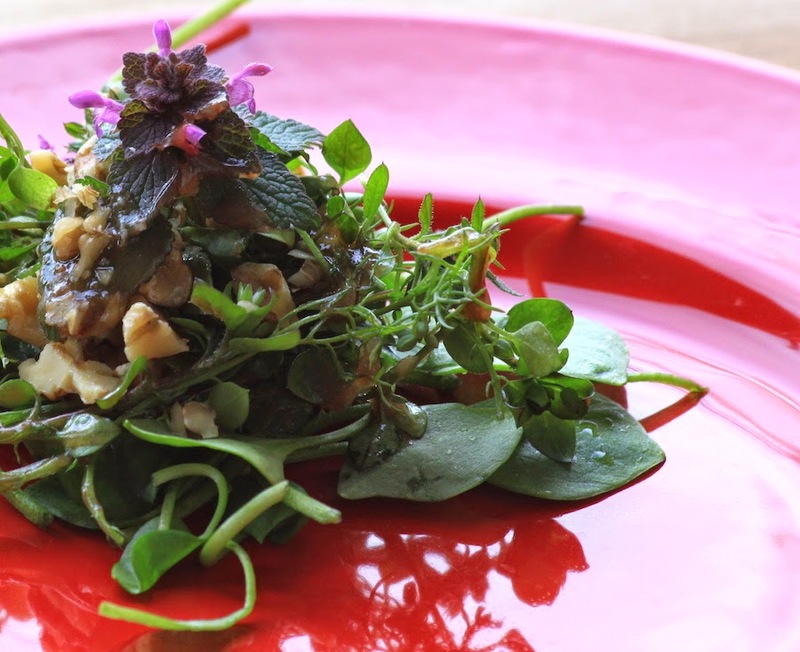 The salad in the picture consists of wild young greens: winter purslane, chickweed, cleavers, camomile leaves and purple dead nettle. Dressing: figs, apple, herbal oil, sea salt and balsamic vinegar. Roughly chopped walnuts sprinkled on top.